How to animate the folding of geometric objects. How to fold of a cube? 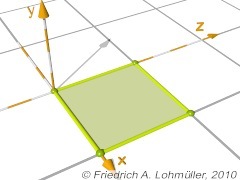 A cube consists of 6 squares folded against its neighbor square by 90°. So we start by declaring a 'Square' object. 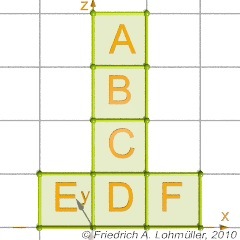 we have to make a chain of the squares A,B,C and D by nested unions. 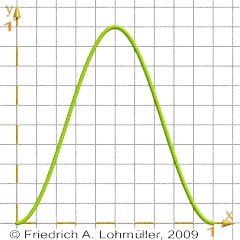 We need to remember that rotation by 'rotate' always turns around the axes! So we first have to apply the rotation and then the translation as shown in the image here right with the first two squares A and B. Note: 'rotation around an axis' and 'translation' commonly are not commutative or not interchangeable, that means: We cannot change the sequence arbitrary! Folding a cube: rotate, move, add next!